In July 2016, UrbanBuilt completed an 8-home renovation project located on the 2300 block of Callow Avenue in Baltimore city. The project was the final phase of the Neighborhood Stabilization Program (NSP2). NSP2 was a program run by the Department of Housing and Urban Development. A grant was awarded to the non-profit lending organization, Healthy Neighborhoods, in partnership with Druid Heights Community Development Corporation, a non-profit community association and developer. NSP2 focused on restoring homes that were foreclosed or abandoned in Baltimore. The program then offered the newly renovated homes to residents at an affordable price. This was UrbanBuilt’s biggest project to date, and a very important contribution to Baltimore's revitalization. The project featured 8 homes that were blighted and uninhabitable, each with nearly 3,500 square feet of living space. Wood windows with Baltimore bullnose trim, Hardiplank siding, restored brick fronts, wood cornices, and solid wood doors were some of the exterior features included to meet CHAP historical guidelines. Each house received energy efficient windows and doors, LED lighting, open cell foam insulation and high efficiency heating and cooling units. These additions met stringent Energy Star guidelines. 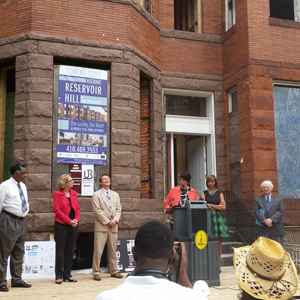 On July 21st, 2015, the City of Baltimore held a dedication ceremony for the project. UrbanBuilt attended, along with Mayor Stephanie Rawlings Blake, local residents, and representatives from the Druid Heights Community Development Corporation, Healthy Neighborhoods, Department of HUD, and State department of Housing. All expressed excitement about this project, which is only the start of the rehabilitation process in this recovering neighborhood.